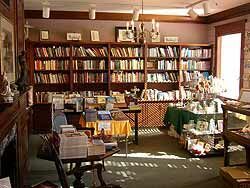 The Nira Smith Bookstore, also known as Cathedral Books and Gifts, was established by the Episcopal Church Women (ECW) of St. Paul’s to generate funds for their outreach projects from the sale of liturgical, religious, and gift items to members of the Cathedral, to individuals and congregations of the greater Episcopal community in Oklahoma, and to the general public. Prayer books, Bibles, Hymnals, other worship guides and resources. Books by well-known and respected theologians and spiritual leaders on journaling, prayer and meditation, labyrinths, saints, relationships and Ignatian, Benedictine, and Celtic spiritual disciplines. A large and varied selection of greeting cards. Handmade pottery wall plaques, crosses and trays by the Sara K. Rubin Company. A variety of rosaries, jewelry and stained glass items, many made by local artisans. Gift items suitable for children including books, crosses, stuffed animals, and gifts for baptism and confirmation.